A very complete and long aging wine from a great vineyard of Serralunga d'Alba. The colour is intense ruby red. The smell is intense, pleasant, balanced and spicy with a bouquet of plums, cedar, tobacco, liquorice, soy and floral notes. 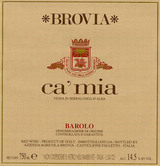 The taste is full bodied, concentrated and rich, with a firm tannic structure that classic Barolo need for a long ageing. As with the Barolo Villero, traditional combinations are with game or red meat dishes. The great balance of this Barolo makes it very suitable also with mature cheese bread.